2012-06-27 Arthur's 2012 Summer Holiday - A Busman's Version! We set out on our annual Coastal Cruise Summer Holiday on Wednesday, 27th June,2012. This year our primary objective was to get to Lawrence Cove Marina in Bantry Bay. It would be new cruising territory for "Arthur" and her crew. The furthest south that we had reached heretofore was Cahersiveen. The problem is that the further south that you get the more time it takes to get back. And it is not just the actual cruising time...it is the time waiting for the good weather that is a pre-requisite for coastal cruising and which is not available every day! So, getting there is one thing...getting back is another story! We departed Portumna circa 16.15 hrs heading for Limerick via Killaloe and Ardnacrusha. Upon entering Lough Derg we came across.a small boat in distress...the outboard had given up the ghost. 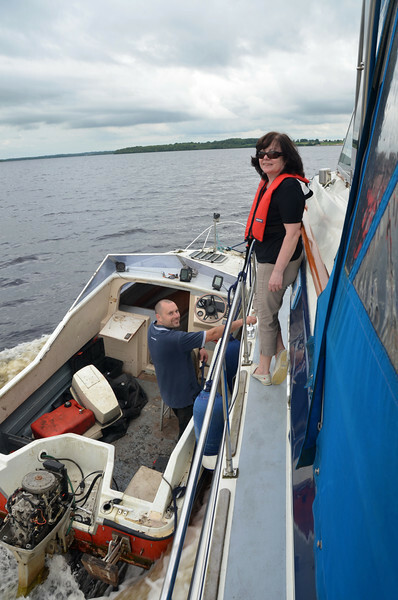 We rafted the boat to our port side and took it over to Terryglass and then resumed our passage to Ardnacrusha.